Yes, I'm aware that it's been a month since the last blog. As I mentioned in the last entry, the exam period at UCL has come upon us and I've been working very long days in the special needs venues. 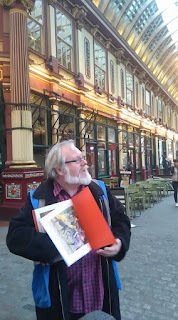 Still, I've been squeezing in a few things, beginning with 'Reaching into the Abyss', my tour exploring Victorian philanthropy in Whitechapel and Spitalfields. The usual reduced-price preview happened on 29 April, and it makes for an interesting contrast to 'The Battle for Bethnal Green', an older tour which happens to the north of Whitechapel. The following day I had a small but appreciative audience for 'Behind the Magic Curtain', my exploration of the contribution Theatreland has made to performance in Britain. Thanks to the good offices of my friend Conti Moll, who teaches at a local school, I was able again to take the two Year Two classes from the Gatehouse School on a Great Fire of London tour in May. 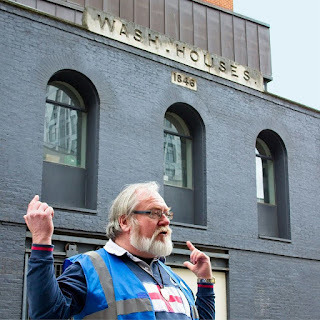 Big news is that Walkie Talkie Part Three got underway at last - after all that waiting and agonising, Tower Hamlets agreed to let the course go ahead with only eight, and then another person enrolled. So, with a dedicated complement of nine we're sailing into unexplored waters which will lead to the group getting out on the streets at last. So far we've learned about Old Ford and Bow, the focal area for the group's tasks, we've considered risk assessment and liability, we've taken in architecture (specifically Decorated Gothic and Georgian), and yesterday evening's session considered the museums of Tower Hamlets. Next Thursday gives the group the chance to do their first task: a four-minute presentation each based on a hypothetical tour with four potential stops. They don't do the tour as a tour; they just report back on their hypothetical plans. That'll have to be all for now. Apologies if this seems a bit haphazard, but I've forced myself to put fingers to keyboard to give you the salient points and remind you that this blog is still active! Anyway, I'm going to close now because I need to get to bed at my earliest to be ready for tomorrow's onslaught - the last day of the working week!